“There is a great model of hospitals up on the Sunshine Coast built around the new Sunshine Coast University Hospital. Mr Thomas said Nambour Hospital was the largest hospital in its region before the opening of the Sunshine Coast University Hospital with 450 beds early last year but will now become a local arm in the hospital network. Under a $86.34 million redevelopment by the Queensland government - due to begin early next year - Nambour Hospital will retain its acute services such as emergency and surgery to service the town and its surrounding region but provide other essential services as well. and new rehabilitation, renal dialysis, medical treatments, cancer care and day unit infusion therapies. At the official opening of the Northern Beaches Hospital on Monday, NSW Premier Gladys Berejiklian described the hospital and its services as “world class” although she acknowledged there had been problems. “I’m incredibly proud that in the last 19 days, 600 surgeries have occurred here already. Six hundred,” the Premier told reporters. “And normally you scale up to that but from day one this hospital’s been functioning as though it’s been around for a long time. Health Minister Brad Hazzard said he was excited about the new hospital. “This is a bit of magic on the beaches, for all of the residents of the northern beaches but indeed for all people across NSW who will find their way to this fabulous facility,” Mr Hazzard told reporters. Other politicians at the opening included former Prime Minister Tony Abbott, former Premier Mike Baird, former health Minister Jillian Skinner, MP for Mackellar MP Jason Falinski and Northern Beaches Mayor Michael Regan. However, Pittwater MP Rob Stokes was absent and did not send apologies or an explanation. On Wednesday, following the opening, Save Mona Vale Hospital campaigners held a “wake” outside NSW Parliament House, where black-clad “mourners” laid out “body bags”, a decorated “coffin” and were met by a larger than life sized puppet of Nurse Karen Draddy – a long-term head of maternity at and advocate for Mona Vale Hospital. Mr Thomas, leading the protest, said he was incredibly angry about what had happened to Mona Vale Hospital. “I am particularly angry that the community’s interests have been totally ignored by this government and quite frankly by our local member Rob Stokes, and by the Health Minister Brad Hazzard,” Mr Thomas told the crowd. Local GP Dr Suzanne Daly a long-term hospital campaigner, told the crowd that the privately-operated Northern Beaches Hospital was set up to suit the interests of some specialists and “we still need Mona Vale Hospital”. In 2012, Dr Daly collected 11,689 signatures on a petition calling for the retention of Mona Vale Hospital to be presented to Parliament but she said Pittwater MP Rob Stokes had tabled it when the chamber was almost empty. “I’m here for myself, my family, my grandchildren but also for my many patients, a lot of whom have no choice private or public. Some of us have choice – they have no choice.” Dr Daly said. NSW Greens health spokeswoman Dawn Walker – who attended the rally with a number of other Greens MLCs including David Shoebridge - reaffirmed the party’s support for the return of all acute services to Mona Vale Hospital. Ms Walker, who last month moved a motion in Parliament supporting acute services at Mona Vale Hospital, congratulated the community on caring enough to bring the campaign to the steps of Parliament House. “We (NSW Greens) will not stand by and see this government do this to you,” Ms Walker told protesters. Greens Health Spokeswoman Dawn Walker at this week's Mona Vale Hospital 'Wake'. Michael Mannington photo. 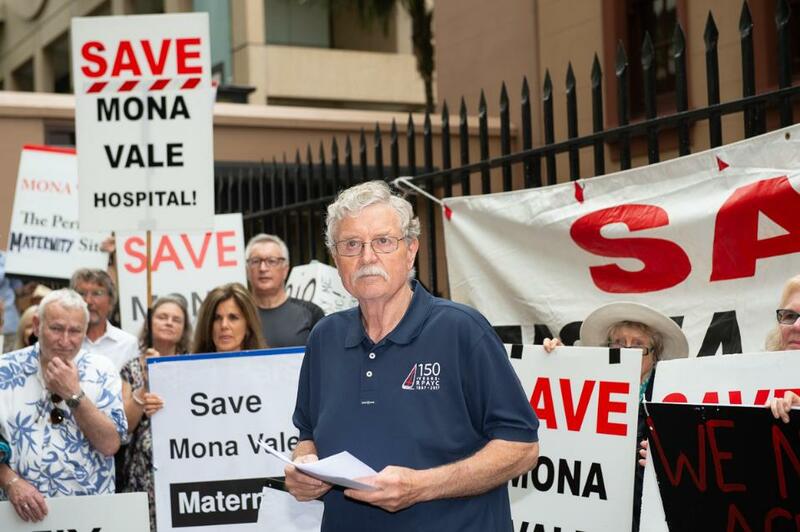 Save Mona Vale Hospital invited politicians from all parties to speak at the rally and NSW Labor Health spokesman Walt Seccord sent his apologies. Mr Thomas also acknowledged the support of the Shooters, Fishers and Farmers Party as well as the Australian Conservatives who along with the Greens have signed the SMVH pledge to keep acute services at Mona Vale Hospital. On Friday, NSW Opposition Health spokesman Walt Secord was refused access to the hospital on a visit booked earlier. Mr Secord said he had been trying to visit the hospital since early October and arrangements had been agreed for a Friday visit, however, Mr Hazzard had intervened hours before the arrangement was due to go ahead. “This is about silencing and gagging any potential criticisms of the embattled privatised hospital,” Mr Secord said in a statement. Local GP Dr. Suzanne Daly speaking at this week's Mona Vale Hospital 'Wake'. Photo by Michael Mannington.